Ahh, the macabre fun one can have just driving down the street at night! Last year while in Denver for the Denver Modernism Show a little nocturnal drive brought me past something as cool as the old neon signs I was seeking. 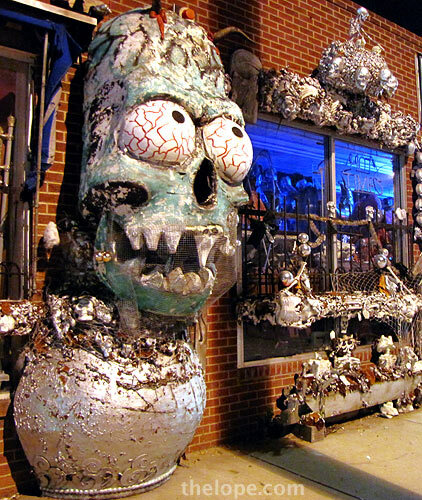 So, for my first post of Ace's 31 Days of Halloween, I present the skeleton-encrusted facade of Flossy McGrew's costume shop at 1824 South Broadway in Denver. 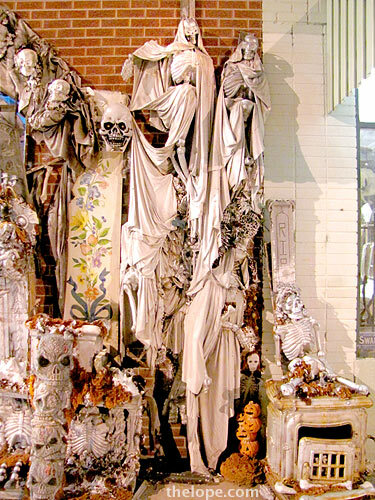 Personally, I think more businesses - no matter what they sell - should plaster some corpses out front this month. Skeletal Maytag repair men, spectral cows atop steak restaurants, undead maids dusting the ether. Such perfect Autumnal reverie this would be.